US special operations forces have conducted a military operation in eastern Syria, targeting a senior Islamic State (IS, formerly ISIS/ISIL) commander and his wife, the US defense secretary has announced. The terrorist leader was killed in the raid. Abu Sayyaf, a senior Islamic State leader, was killed by US forces, Defense Secretary Ash Carter said on Saturday, adding the terrorist was involved in the group's military operations, as well as helping to direct its "illicit oil, gas and financial operations." "During the course of the operation, Abu Sayyaf was killed when he engaged US forces," National Security Council spokesperson Bernadette Meehan said. U.S. Special Operations forces conduct raid in Syria, kill senior ISIS commander, sources tell CNN. The raid in eastern Syria's al-Amr was carried out at the direction of President Obama, the Defense Department said, and also targeted the Islamic State commander's wife, Umm Sayyaf. The woman, also suspected of being an active IS member, was captured by US forces. It is now being decided where to bring her from custody in Iraq, according to Meehan. "The president authorized this operation upon the unanimous recommendation of his national security team and as soon as we had developed sufficient intelligence and were confident the mission could be carried out successfully and consistent with the requirements for undertaking such operations," Meehan added. The dead militant leader was a Tunisian citizen. Washington informed the country’s government after the raid against him was carried out, Reuters reported, citing a US official. It is believed Abu Sayyaf may have been in contact with IS leader Abu Bakr al-Baghdadi, CNN reported, adding that the US military managed to capture some of the terrorist's communications equipment. No US military were killed or injured in the operation, the US Defense officials reported. A Yazidi woman, who had apparently been held as a slave, was also rescued. Another dozen fighters were killed in an overnight US raid, an American official speaking on condition of anonymity told Reuters on Saturday. 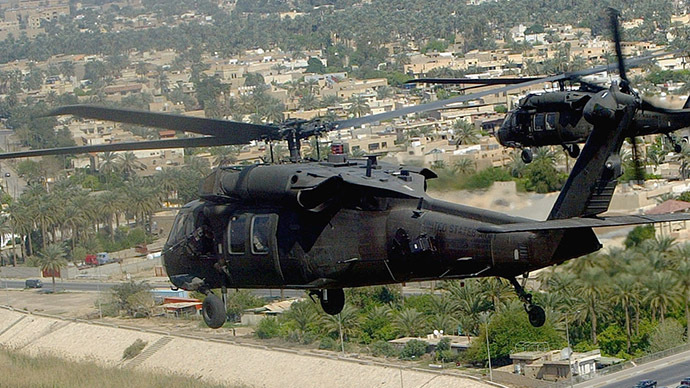 Special forces based out of Iraq flew into Syria on Friday night by helicopter. Meehan says the operation was conducted "with the full consent of Iraqi authorities" and "consistent with domestic and international law." The White House didn’t coordinate the military raid with the Syrian government, the US spokesperson said. "Nor did we advise them in advance of this operation," Meehan added, saying "the Assad regime is not and cannot be a partner in the fight against ISIL [the Islamic State]." Earlier on Saturday, Syria's state media reported that 40 Islamic State militants, including an ISIS "oil minister" Abu Taym Saudi were killed by the Syrian army in the country's east. Media reports said the terrorist leader was responsible for oil-related affairs in the Omar oil field in the strategic town of Mayadin, which has been under the control of the extremists since July 2014. The Syrian media report was later called a mistake by a group tracking the Syrian civil war, Reuters reported. According to Rami Abdulrahman of the Syrian Observatory for Human Rights, the Syrian news had incorrectly taken credit for the US special forces’ operation. US-led airstrikes have been targeting the militants positions since September last year. Earlier this month, a monitoring group claimed that dozens of Syrian civilians were killed in just one day of the airstrikes. President Bashar Assad has repeatedly pointed out that the US military operations in Syria are an illegal intervention, violating the sovereignty of the country, as it has not been authorized by a UN Security Council resolution.